There’s something truly magical about steam trains, from the chuff chuff sounds while they’re in motion to the comforting smell of coal from a bygone era. Britain’s steam railways are cherished, and North Norfolk is home to one of the most scenic heritage railways, The Poppy Line. There are many ways to appreciate North Norfolk’s stunning coastal countryside, whether you enjoy walking, or have sturdy sea legs and like to get out on the water. 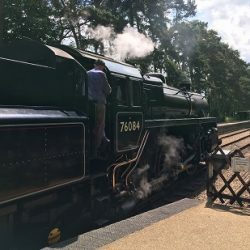 For Peter McMillan, a Sales Consultant from Norwich, the steam train at Sheringham was a chance to see the coast from a unique and stunning perspective. 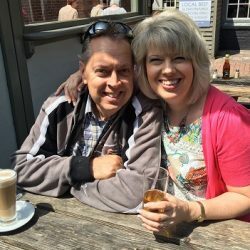 Peter and his family regularly escape the hustle and bustle of city life to their caravan at Eccles, about 35 miles east of Blakeney. Family time takes priority, and with two teenage boys, their favourite pastime is spending days on the Norfolk beaches; including Sea Palling and Happisburgh. Peter and his family have been enjoying the attractions of North Norfolk for years, including Titchwell Marsh and Pensthorpe. Sheringham, however, was a new place for them to explore. For history enthusiast Peter, a visit to Sheringham wouldn’t have been complete without exploring the steam railway. After visiting Bressingham Steam Museum previously and taking the steam train journey from Wroxham to Aylsham, going for a ride on The Poppy Line was top of the list. Everything came together on the day to make the trip perfect, from stunning weather to helpful staff and a tasty picnic lunch. “The train journey was a highlight for all of us! It was warm and sunny, so there were great views along the whole way. We even planned ahead and took a picnic lunch to have on the train. Everyone was very helpful, polite and friendly. Built in 1887, The North Norfolk Railway ran officially until 1924. It’s now supported by the Midland and Great Northern Joint Railway Service. It boasts six steam locomotives and work is underway to restore another. 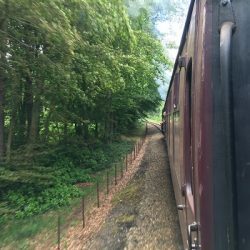 It offers a unique experience, with a regular timetable that alternates steam and vintage diesel trains along 10.5 miles of the original line, through the changing landscapes. 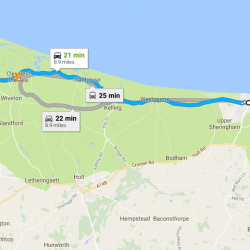 On completing the whole journey, you’ll see the wooded hills at Sheringham Park melt into the sea at Holt. Another aspect that makes The Poppy Line so special is the army of volunteers. The drivers, guards, signalmen and booking office clerks all have a passion for the line and are keen to share this with others. For Peter, a visit to the railway is a must for anyone who appreciates the beauty of steam. As the activity was also enjoyed by his teenage sons, he’s already planning a return trip. The steam line regularly runs throughout the summer months, until the beginning of September. The timetable then alternates between steam and diesel until the end of October. You can view the full timetable on The North Norfolk Railway website here. 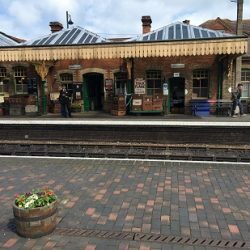 Running from Sheringham to Holt, with stops at Weybourne and a request stop at Kelling Heath Park, The Poppy Line offers more than just a train ride; a whole day can be built around the journey. If your sense of exploration calls, why not hop off at each station to take in the atmosphere from a bygone age? At Sheringham station, there’s a children’s activity coach, souvenir shop and a buffet. The station is also conveniently placed to stroll through the town. Access the Kelling Nature Trail or coastal footpath and venture off on foot, before hopping back on for a relaxing ride back. For something a little more special, you can alight the train for Sunday lunch or a romantic evening dinner. Murder Mystery trains run until the end of October if you fancy doing something different on your next North Norfolk break. On the 7th and 14th of October, you can even book a Driver Experience Day and offer someone who loves steam railways the chance to become a driver. If these activities take your fancy, be sure to book early to avoid disappointment. 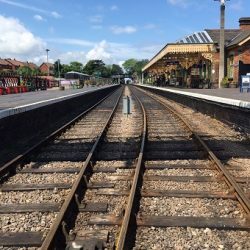 The largest car parks close to the railway are at Sheringham and Holt stations, so you can leave your car in one place to enjoy the day riding the trains. All the trains can accommodate wheelchairs. Dogs and bikes are welcome on all trains although there is a small additional charge of £1. There’s also a buffet facility on some trains which serves a wide variety of hot and cold drinks, and picnics are welcome. If you want to make a day of it, a rover ticket entitles you to a day’s travel and is ideal if you’re planning on getting on and off. An adult ticket is £12.00; senior citizens is £11.00 and a child aged 5-15 is £8.50. A family ticket for two adults and two children is also available for £40.00. If you’re coming in a large group of over 20, a special fare is available. View all fares here. 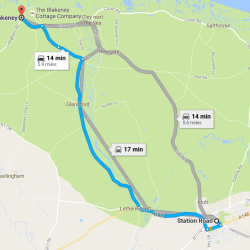 Sheringham Station is a 25-minute drive from The Blakeney Cottage Company HQ in Blakeney and Holt Station a 15-minute drive.